Lest my friend M think that he’s the only one knowing how to turn the odds and ends in the fridge into a hit among friends, Nam Prik Pao Fried Rice with Pineapple and Shrimp, I thought I’d share my latest kitchen improvisation. This fried noodle dish has no name. 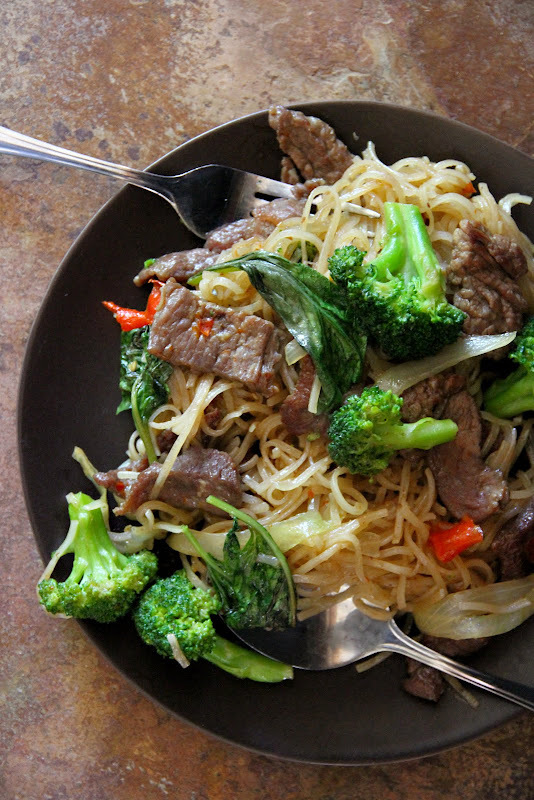 You can called it spicy Thai fried noodles with beef and broccoli, if that makes sense. I always call this “noodles with no name” just because it sounds like the American song, A Horse with No Name — the song that constantly reminds me how little I actually understand the English language. Before doing anything else, soak the noodles. It will be a while before they’re ready, so allow time accordingly (see tips on how to prepare dried rice noodles). Slice the beef thinly across the grain, put it in a bowl, add the dark soy sauce and baking soda to it, mix thoroughly, and let it marinate while working on the other ingredients. Peel the garlic and remove the stems from the bird’s eye chilies. If you have a mortar, pound the two ingredients into a paste. If not, mince them finely with a knife. Set the mixture aside. Peel and slice the onion(s) into 1/4-inch slices; set aside. In a small bowl, mix together the salted/fermented soybean paste, oyster sauce, fish sauce, sugar,and water; set aside. Set a large saute pan over high heat. Once the pan is hot, add the vegetable oil, followed by the marinated beef. With the tip of your spatula, separate the beef pieces from each other. Allow the beef the brown, undisturbed, on one side. Flip the beef pieces and let the other side brown. Add the garlic-chili paste to the pan; stir. Once the garlic becomes fragrant, add the onion slices; stir until they are somewhat translucent, about 2 minutes. Now decide whether you like your broccoli (a) tender crisp or (b) somewhat soft in a stir-fried noodle dish like this. If (b), add the broccoli florets to the pan now and cook until they’ve softened up a bit. Then add the drained noodles followed by the pre-mixed sauce. Stir-fry until the noodles are soft and chewy (it may be necessary to add a bit more water to the pan). If (a), add the drained noodles and the pre-mixed sauce to the pan; stir-fry. Once the noodles are almost done, add the broccoli florets and continue to fry until the noodles are done and the broccoli is tender-crisp (more water may be necessary). Once the noodles are ready, turn off the heat and stir in the basil leaves. Love the recipe! I also like to cook with fermented soybean sauce or paste as it adds so much umami and aroma to a dish. Hi there … just a comment … do you know that Horse stood for heroin in Neil Young’s song ‘Horse With No Name’? I’m commenting because out of all that literality you have created, the actual experience of using heroin is actually what this is about – quite aside from all the meanings/interpretation that are done so exquisitely on your part 🙂 I totally adore your posts by the way … they are the best in the entire world of blogging – thank you so much for them and the wonderful way you write! Making this for lunch today! Thanks for the great recipes Leela. We’d like to make this tomorrow, but our dish need to be gluten-free. Any ideas on what we could use instead of the fermented soybean paste, since that contains wheat? Scott, sometimes rice flour is used to ferment the soy, but to be on the safe side, leave it out entirely and increase more fish sauce (to taste) to make up for the loss of salinity. Or you replace the fermented soybeans with the same amount of gluten-free miso if you some lying around (in which case, keep the fish sauce amount the same).